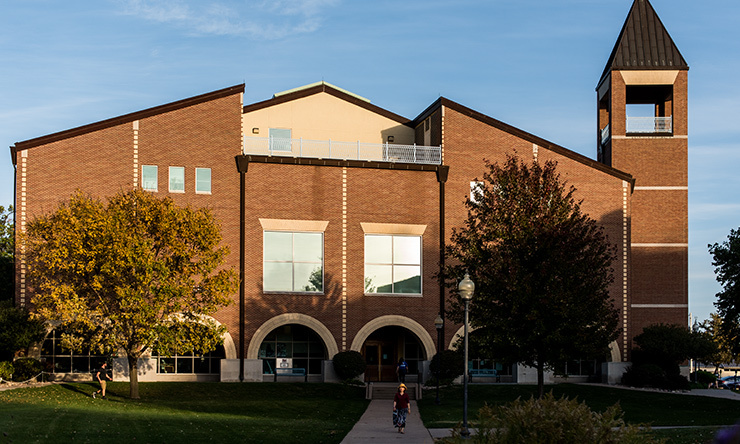 The St. Ambrose University Library selects, organizes, and maintains print and electronic resources that support the curriculum and information needs of our campus community. 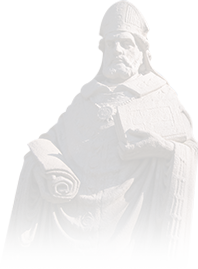 We contribute to the educational mission of St. Ambrose University by teaching library use and strategies for independent learning and providing an environment that encourages study, intellectual and cultural endeavors, and personal growth. April 18 - 7:45 a.m. - 9 p.m.
May 1-2 - 7:45 a.m. - 1 a.m.
May 3 - 7:45 a.m. - 5 p.m.
May 4 - 7:45 a.m. - 9 p.m.
May 5-7 - 7:45 a.m. - 1 a.m.
Fridays: 7:45 a.m. - 5 p.m.
Saturdays: 10 a.m. - 7 p.m.
We offer research assistance, library services and collections in LibGuides. The Hot Topics Guide is a selection of guides on popular topics with authoritative sources to help students gather excellent information for their papers and projects. 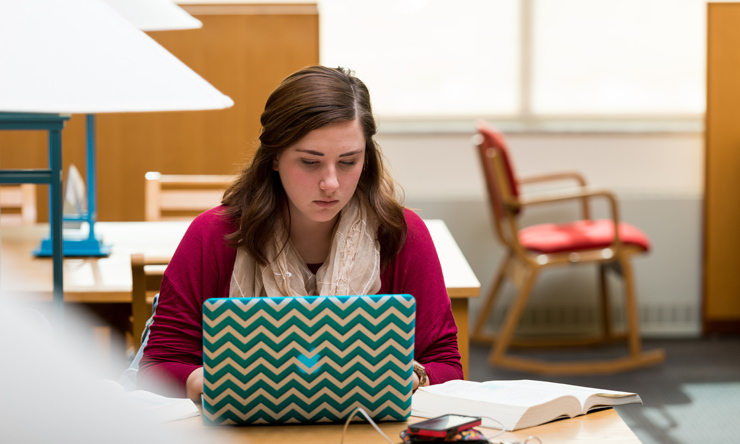 Find books, articles and more from the SAU Library as well as a wide range of online sources. Electronic and audio books available through EBSCOhost. Use these sources to begin your research. Encyclopedias, dictionaries, and more. The SAU Library provides access to thousands of online articles and hundreds of printed journals. In general, all journals from the last 10 years are on the first floor; earlier years are on the Lower Level. A list of the journals and database links is on the A-Z Databases page. You can also do a search for online articles, books, and more at Library Central. For questions or help in finding information in journals or articles, consult a reference librarian. Archives and Special Collections are located on the third floor of the library. Appointments are preferred. Please contact the Archivist, Onnica Marquez at marquezonnicaf@sau.edu or 563-333-5868. The mission of the St. Ambrose University Archives is to preserve, arrange, describe, and make accessible historically significant documents and other materials which reflect the University's origins and development, and the activities and achievements of its officers, faculty, staff, students and alumni. The St. Ambrose University Digital Collections features digital materials from the St. Ambrose University Archives. The St. Ambrose University Library's collection of books and materials on Ireland, the Irish peoples and the Irish in America has been significantly enhanced by the generous gift of Dr. Lawrence J. McCaffrey '49. The following pages list the titles, authors, and call numbers of the books placed in our collection, as well as the many unusual and interesting article reprints which are kept in our Special Collections area. BOOKS List of books added to St. Ambrose University Library's circulating collection. ARTICLE REPRINTS List of items placed in St. Ambrose University Library Special Collections. Dr. Timothy Walch, retired Director of the Herbert Hoover Presidential Library in West Branch, Iowa, has donated his private collection of Irish and Catholic Americana books to the Library at St. Ambrose University. The collection includes books on Irish artists, biographies of Irish figures, novels, and Irish American culture. The donation is being provided over a three year span beginning in 2005, with approximately 600 books being received each year. The books join the Lawrence McCaffrey Irish History collection at the Library to comprise one of the largest Irish Studies collections in the region. The following documents list the titles, authors, and call numbers of the books added to our collection. Dr. Kenneth J. Hartman, St. Ambrose College Class of 1939, donated his private collection of books and videos on the manned space flight programs in the United States and Russia to the St. Ambrose University Library. Hartman worked as a human factors engineer for North American Aviation, the company that built the Apollo command module that ferried men to the moon. His role was to act as liaison between the astronauts and the design engineers. Hartman went on to work for McDonald Douglas and as an instructor of statistics and math before retiring in Oregon. Additional information about Dr. Hartman can be found in the Library's Special Collections & Archives on the third floor.